This article quotes generously from the excellent site Stringforum. The string market is a jungle. There are countless of brands, materials, and suppliers who work hard to get on the racket of top players as well as amateurs. You can divide the different kinds of strings in either natural (gut) or synthetic strings. Natural gut strings are made of cows’ gut in a complex process which renders them far more expensive than synthetic strings. They are lively and elastic strings, but sensitive to weather conditions. There are still professional players who use natural gut in (usually half) the string bed, but for amateur and intermediate players it’s not a common option due to their cost and sensitivity. They break easily which makes them even more expensive and you would need to re-string your rackets quite often. Synthetic strings are the name of the game these days and here you have a variety of different types and characteristics. Here are the main types of synthetic strings. The most frequently used string type. 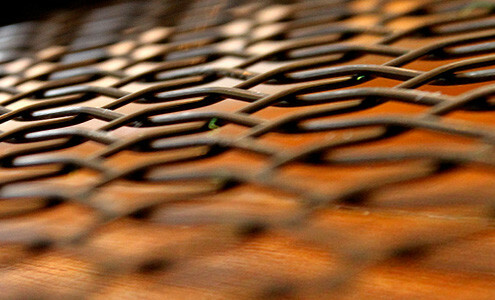 Nylon strings are normally made of a single nylon core and various resistant wraps. Due to its excellent dynamic properties nylon (polyamide) is well suited as a material for tennis strings. The high number of different types of constructions (wrap material and wrap angle) influence the string’s playing characteristics significantly. As a rule of thumb, nylon strings with multiple wraps can be considered higher grade than single wrap nylon strings. The wraps reduce the tension loss usually experienced with nylon strings. Nylon strings are suitable for players who have a normal or high string consumption. Polyester strings show a fairly simple structure: they consist of a single polyester fiber with a thin coating. This type of construction is termed “monofilament”. They come in different gauges (1.10-1.35mm) which enables you to choose among different elasticity/durability levels. Polyester strings feel quite stiff compared to nylon or multifilament strings, but on the other hand they provide significantly better durability, allowing for thinner gauges. Polyester strings are only recommendable for players with high string consumption. For these players, polyester strings offer a great price/performance ratio. To bring synthetic strings’ playability more into line with natural gut, many microfibers (which can be of many different materials) are twisted together to a string, which is wrapped with a resistant cover. This means you get higher elasticity and better playability. The problem is that multifilament strings tend to break soon once the outer wrap is damaged (the strings “fray”). Also these strings cost more than nylon strings because of the complex manufacturing process. Structured (textured) strings are designed to provide better ball bite and thus enhanced spin (it seems to be all about spin these days!) Most of these strings indeed offer great spin potential and in line with that better control, but unfortunately the texture usually wears within a short time and the strings become smooth. Another downside is their decreased durability. Hybrid strings are a combination of two different strings for mains and crosses. In a uniformly strung racquet it’s almost always a main string that breaks. This is because the main strings move a lot more than the cross strings so the cross strings “saw” into the main strings, causing notches and eventually breakage. That’s why in hybrid strings usually a durable string is used as the main string (e.g. polyester or aramid/kevlar/technora). As cross strings usually highly elastic synthetic strings or natural gut strings are used to provide comfort and feel. Hybrids provide good playing characteristics while a poly/multi hybrid often lasts longer than a pure poly or pure multifilament string job. Strings lose elasticity with time, one type of string faster, another type of string slower. This has a negative effect on the playability; players with a sensitive arm will feel it soon. In general you shouldn’t play a string longer than 2 to 3 months. Then it’s about time to cut out the strings and restring your racquet. I just wanted to ask for your take on strings setups and brands, especially between co-polys and hybrids Do they generally perform better? Durabillity? Price/Performance? Are co-polys and/or hybirds better than full bed of multis? I understand if you cba to answer but I would kindly ask you to at least suggest a few soft co-polys, for me to try. It’s difficult to answer because like with racquets it has a lot to do with personal preferences, racquet you use, etc. However, I can try to answer with some personal thoughts and opinions. You can go crazy with different string options, especially when you throw hybrids in the mix. It all depends on what you want. If you hit the ball pretty hard with some top spin, I think a co-poly is a must, but if you also have elbow/wrist issues it could be a good idea to hybrid it with a multifilament or a natural gut string for a softer feel. Put gut in the mains for more power, and poly in the mains for more spin. Hybrids are usually more expensive, especially if you want the ultimate hybrid which is essentially adding gut. Since you’re already playing rather soft racquets, I think you can do no wrong with a great string such as Cyclone. The thinner gauge will give you more feel as well. The 35 lbs might be too powerful (for me at least! ), but the 50 lbs sounds like a great option. 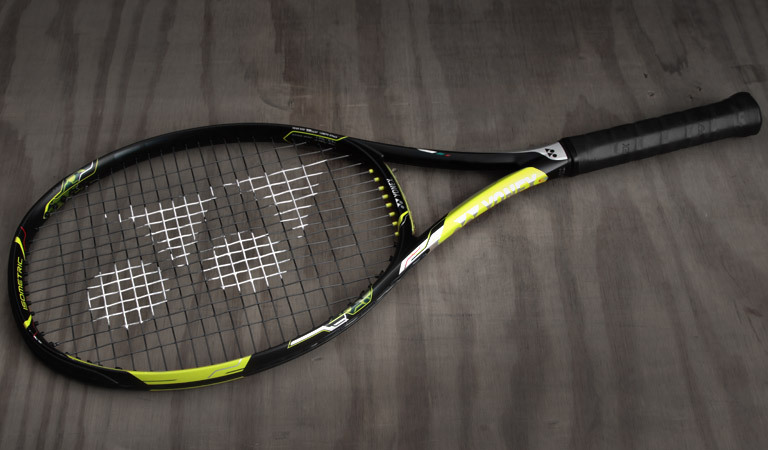 The PB 10 is a wonderful racquet. BHB is also a solid string. If you want more soft co-poly options I would look at Tourbite soft or any of the new 19 gauge strings that are out on the market. Luxilon Alu Power soft and 4G soft are also nice strings. But I think you’ll definitely like Cyclone in your PB10.